R. Dugan discovered 506 Marion in 1903 February, afterwards it was named for his cousin. It is a type C asteroid of about 104km size. 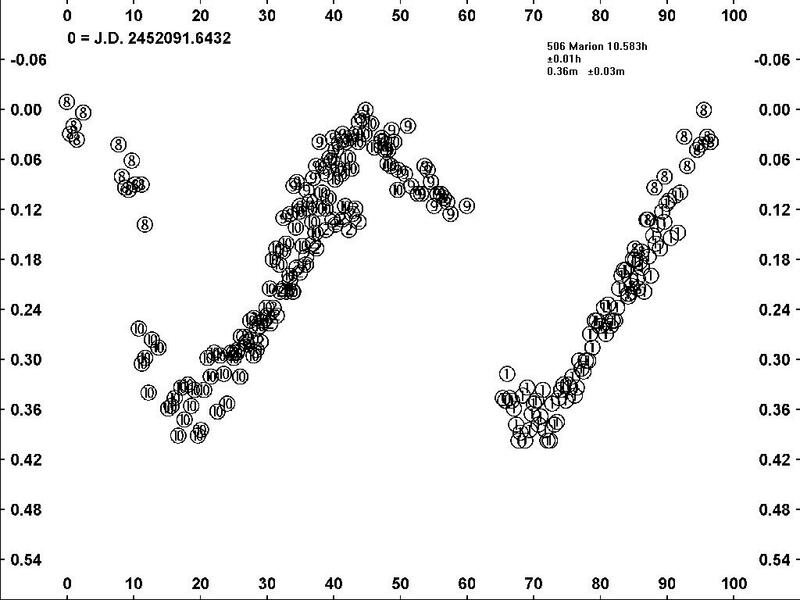 As might be guessed from its spectral classification, Marion favors the outer reaches of the main belt, having a semi-major axis of 3.04AU and inclination of about 17. Robinson obtained observations on the nights of 2001 July 1, 14, 21, and 30. Data was also obtained on two other nights, 2001 June 30 and August 1. They were of short duration and suffered from considerable noise and so were not used in the period determinations. Over the total span, the phase angle of the asteroid decreased from about 14 to 7. Using the four good sessions, a period of 10.58h +/- 0.01 was found as well as an amplitude of 0.35m +/- 0.03m. Published in the Minor Planet Observer Volume 28, Number 4, A.D. 2002 October-December.